Sidas are OK. Daughter swears by the red ones for figure skating. I've used the blue sports ones and thought they were great until I used the Lynco L420. Foot balance custom are way too stiff. Maybe I had to break them in but didn't feel right after lynco so they sit in my tennis bag unused. £45 down the drain. However my son had foot pain cured by them. Horses for courses, I reckon. Anything better than the garbage in most shoes out the factory. If Under Armour launch a tennis shoe, this maybe tricky as they normally have an embedded insole you can't remove. Luckily tend to have decent arch support and 4d foam in the Currys and higher end running shoes. Are CurriexSole ok? I just bought them (flat arch - red) without doing any research in insoles. Lol get the joke? I was shockingly surprised at how much it helped me recover, fast. What these pictures don't show is that the heel is crowned with some nice foam, and that helped a ton as compared to the flat gel insoles. What is the difference between Artilage & Kingfoam? Interestingly, I am not so sure that impact dampening is what I am looking for. I don't jump like Federer while I hit my shots. Every lunge, hop, strong step causes shock on your ankles and joints. I find the accumulation hurts more than the big infrequent leaps. 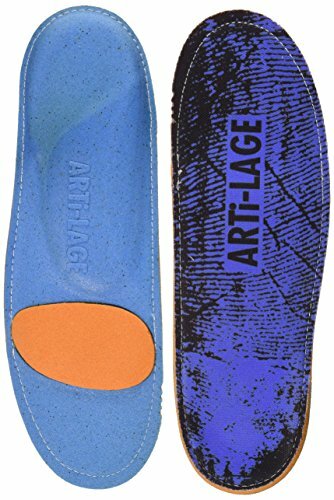 The artilage insoles pretty much erase the minor wear and tear and significantly reduce the big shocks. Interesting. Did you heat them in the oven and stand on them (or sit down and put your feet on top of them)? That's only if you buy the custom orthortic version. The regular ones are just flat or with prebuilt arch support. If you buy the custom ones it's better to make them on special mashine in the shop. Those Footprint insoles must really be popular. I can't find any on the internet in size 10-10.5 and 9.0-9.5 is rare. They must have problems keeping up with demand. I've worn a pair of Currex ActivePro insoles since Feb this year. They weren't cheap, but have been great so far. I previously had Super feet and I think these offer a bit better cushioning, similarly good support and are looking a bit more durable. So, on my limited experience I'd recommend them . How much thicker feeling are these than the original insoles? The issue I have with replacement insoles that have good cushioning is the substantial reduction in space inside the shoe. SofSole Athlete's make shoes that were perfect with the original insoles fit too tight. So, using these (or similar well cushioned products) requires the commitment of purchasing shoes in larger sizes to accommodate them. This can result in fit issues elsewhere in the shoe (like the heel). Is there anything that fits like the originals but provides cushioning like the better aftermarket products? check this out guys. they can't break the egg..sorbothane protection is unreal.. I have sorbothane pads in my daily office shoes. Don't help much. Like I said earlier, impact absorbtion apparently is the not the metric that works for my feet. Still searching. This girl is really cute. do you have her phone number ? and maybe she can tell me the Sorbothane shoe website name ? I wonder how much that bowling ball bounces if there was no insole. My guess is almost zero. How would you use this half lenght sole? Put it right on stock insole? You and @Justin Yesso have convinced me to check them out, and I've finally found an online retailer in Australia that sells them. Can't wait get my hands on a pair of them now. Justin and Gino, which Artilage model do you have? As Ramon said, I cannot find the insoles in my size. The shopping section of the website is down as well. I knew that site. Is artilage and footprint are same insoles? I don't see any local dealers carry them. Also selecting insoles without trying cost me few times in the past. sorbothane material also makes such bold claims (94.7% impact protection). I am going to try the sorbothane maximum duty impact protection (tried out in store)...let see..
Nope, it's all made in China by Foshan Linzhi Polymer Materials Science And Technology Co., Ltd. who owns the tech and the artilage brand, somewhere in southern China, I found them on Alibaba selling Sh18 to Sh48 foam sheets that's used to make these insoles. The material is PU. FP/Kingfoam either get material or finished insole from them. Looking at it, there is no sorbothane at all under entirety of your big toe, that just make no sense for tennis. Sorbothane is under heel & front for impact protection. If you want entire length of sorbothane material checkout classic insole. I like ultra version (popular in running) but maximum has sorbothane under heel area as well (try in shop and you would know the difference). But yeah, King foam does the same thing for skateboarders and did basically the same test. I have the 5mm low profile. I've noticed just like @Justin Yesso that the foam is starting to deteriorate. I am not sure if this trend will continue, but I am a bit frustrated by it. You win. I just ordered the Arti-Lage brand insoles from amazon for $33 (gasp). I will give an update next week. I had all kinds of problems with Plantar Fasciitis and achilles pain until I started using the green Superfeet. I've been using them for years now and I never have any issues anymore. There is not as much cushioning as the orange ones, but the orange ones don't support the same way. I thought I needed more cushioning in the ball of the toe area, because I was getting some pain there, which is why I looked into the orange ones, but eventually the pain went away and it hasn't been an issue since the first pair. I replace them about once a year and have a spare pair for my everyday street shoes. And I have the ArtiLage all ready to go for tomorrow! I think I am going to get a Footprint. Should I get Gamechangers or Kingfoam Orthotics? I'm really not sure which one to get. I have a flat/low arch foot. FP high profile >>> GR6 stock insole >>>> sorbothane classic >= Yonex PCD/Fusion Rev stock insole. Classic insole is not for heavy users like us (hard courts max impact). As for heavy duty, like I said, key material not under my big toe then what's the point? Maybe it's OK for you, but not for me. It was suggestion. I am not salesperson for any insole. We use what work for us and inform others when they need help.